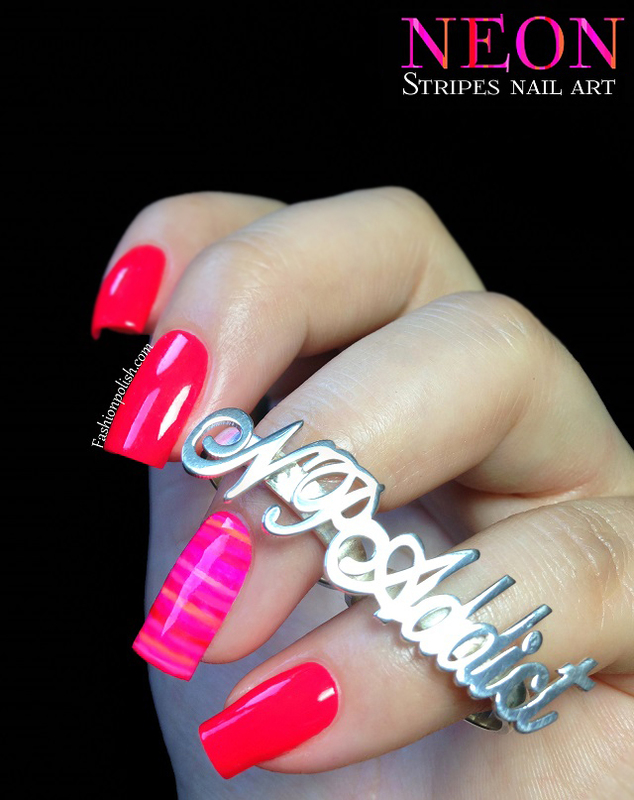 Fashion Polish: Neon Stripes Nail Art feat. 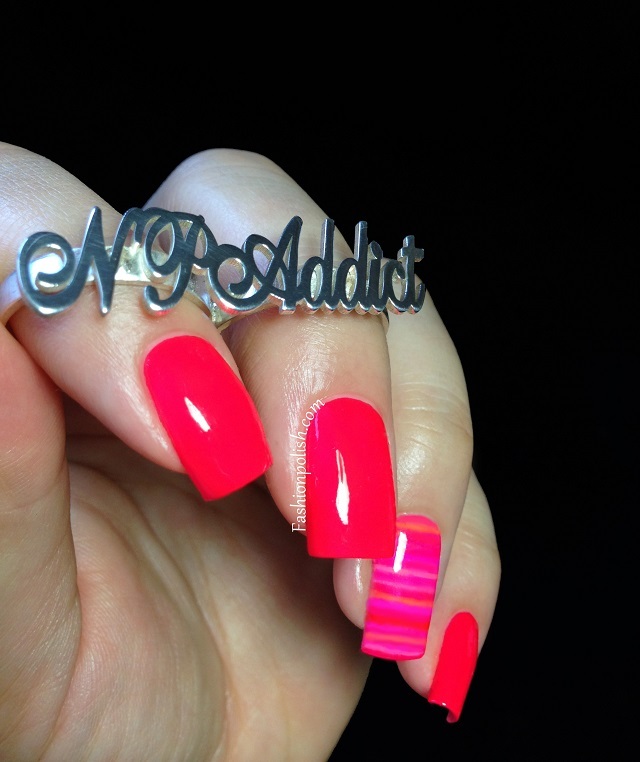 China Glaze Neons and ONecklace Custom Ring! Neon Stripes Nail Art feat. 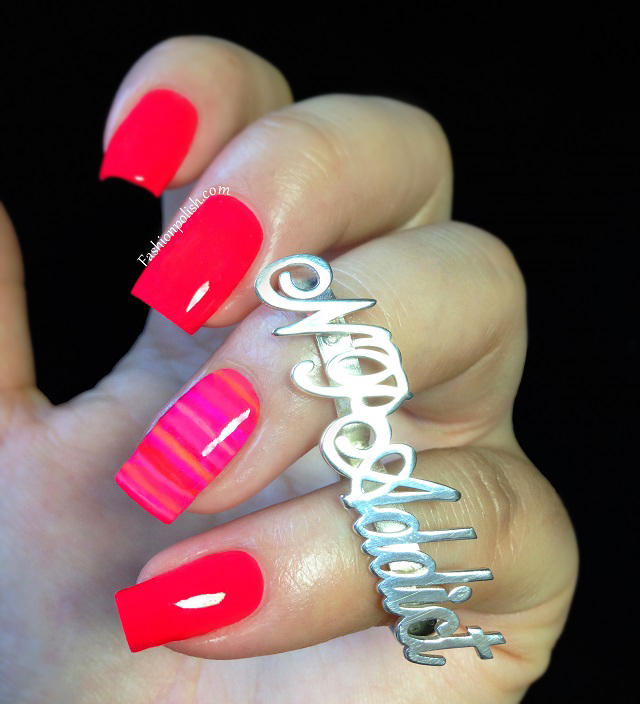 China Glaze Neons and ONecklace Custom Ring! Well, I have a special post for you today! A little while ago I was contacted by a custom jewelry website ONecklace.com, asking me if I'd be interested in reviewing one of their products. At fist I was kind of meh... You wouldn't believe how many review requests bloggers get for all sorts of stuff, including things that have nothing to do with our line of content... Completely irrelevant and uninteresting for you girls! To create this manicure I used China Glaze Pool Party from the Summer 2010 Poolside Collection, probably the best neon collection ever released (Flip Flop Fantasy was part of that collection as well) but also a whole bunch of various other ChG pink and coral neons from Summer 2012/2013. I applied 3 very thin coats of Pool Party on my index, middle and pinkie and sealed with topcoat. On my ring finger, I started with 2 thin coats of white, allowed it to fully dry and then slowly drew neon stripes on top, carefully, while alternating all other neon colors I had. Finally I topped that with 2 coats of topcoat. Pretty easy, only a bit time consuming I guess but the result was super bright and almost blinding, pure neon love! And now the ring! It's a 2 fingers sterling silver ring that you can customize with your name or any chosen word. ONecklace offers a really wide range of sizes to choose from and of course both fingers don't have to be the same size. I love this custom ring! It's made of sturdy, high quality silver and I can only say good things about order processing and shipping. ONecklace offers a very wide range of custom jewelry : necklaces, bracelets, earrings, rings,... The only downside I could find is that the 2 finger ring only comes with the Alegro font and I would have loved different fonts to choose from but I guess they might just expand the ring range in the future. The Sterling Silver Alegro Two Finger Ring retails for $48.95 (instead of $74.95) and is available for purchase on ONecklace.com (free worldwide shipping). What do you think about this ring? And this eye-searing stripes nailart?